As I write these words, I’m en route to New Orleans, looking out the window at the twinkling lights as the sounds of the plane—the steady hum of the engine, clicking seatbelts and a few whimpering babies—hum around me. Although I’ll be giving a talk tomorrow afternoon, my mind is a million miles away from the conference. Instead, I find that my thoughts keep circling back to Thanksgiving. Thanksgiving, as I’ve mentioned before on this blog, is one of my favorite holidays. This one is particularly special to me because it will be the first time I’ve ever hosted a Thanksgiving feast of my very own. In college, I would return to home to Pennsylvania for the holiday, where the traditions my family had built up over the years waited for me: sweet potatoes, cauliflower cakes, turkey, Grandma’s stuffing, pumpkin pie and pumpkin rolls stuffed with cream cheese (my weakness!). During my year in Japan, I found myself at McDonald’s eating—of all things—a Big Mac to mark the holiday. In grad school, I’ve often found myself the guest of various friends, not being in charge of the whole meal, but of only a small portion: a dessert or a side dish. I’ve made pumpkin cakes, pumpkin cheesecakes and mushroom bread puddings, but never have I had the pleasure of fully planning a meal from start to finish. As you can imagine, I’m more than a little excited about this. I like the challenge that it poses, as well as the thought of forging new traditions. Of course, although I relish the thought of next week, the annual Slavic conference (Slavic conferences are very poorly planned; this one, the biggest of them all, always falls the week before Thanksgiving; the other Slavic conference is a few days after the New Year and, even more strangely, very close to Russian Christmas) always puts a crimp in my plans. As I’ve discovered during these six long years, the academic lifestyle is not very conducive to the holiday spirit; I’ve looked longingly at many a jack- ‘o-lanterns and Christmas trees, but never have I had time—or, really, made time—for such traditions of my own. This past weekend, however, I decided to get into the holiday spirit a little early. My tendency to plan means that I’ve been poring over food magazines and cookbooks for the past month, debating the merits of creamed peas with onions vs. creamed spinach, or whether I should go the traditional route with my mashed potatoes or I should give them an elegant note by mixing in some fragrant celery root? Needless to say, decisions, decisions and the clock is ticking. Interestingly enough, I decided on dessert quite easily—truth be told, almost too easily. The Greek, a cheesecake lover, wouldn’t be happy if the pumpkin cheesecake that I’ve made for the past two years didn’t appear on our table. 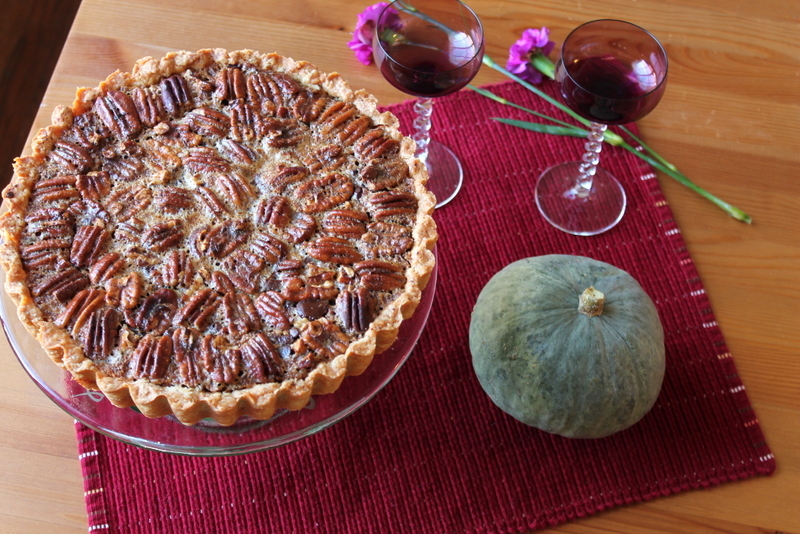 Besides something pumpkin, which is de rigeur, I also found myself fantasizing about some kind of pecan pie. This is something that never appeared on our Thanksgiving table when I was growing up. I remember once asking my grandma why this dessert, one that so many associate with Thanksgiving, never made an appearance on our table, but, strangely, I can’t really remember her answer. All I can remember is my childish indignation upon discovering that there was some stickily sweet dessert out there that I was never given the opportunity to try. This is why, when I was thumbing through the November issue of Bon Appetit, Suzanne Goin’s recipe for a Chocolate Pecan Tart spoke to me. The longing of my inner child had been awoken. Allowing the spirit of Thanksgiving to come upon me a little early this year, I decided to give the recipe a try for a dinner we were having with the Greek’s parents and a few friends this past weekend. When it emerged from the oven, I couldn’t help but feel that it, with its golden sheen and carefully arranged layers of pecans, looked like a distinguished guest that would bring only honor to my kitchen table. And, after my first bite, this impression was more than solidified. 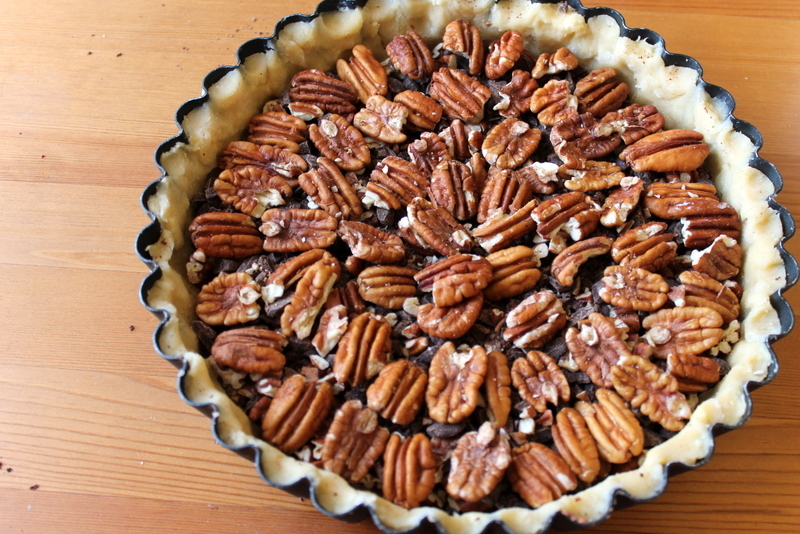 I loved the gooey chocolate and sugary-nut mixture, the firmness of the crust and the fact that, although the tart was as sweet as pecan pie ought to be, the dark chocolate offered a welcome balance to all of the sugar. Needless to say, I’ll be making this tart again for our meal next week. And, although there are always tempting new recipes to try in cookbooks and glossy magazine spreads, I think it’s safe to say that I’ve found myself a new holiday tradition; this tart is going to be a part of my Thanksgiving spread for many years to come. When it comes to making tarts and especially the crust, I’m often resistant to the idea of rolling the dough out with a rolling pin. Pressing it into the pan simply appeals to me more; I always feel that tart dough is too delicate for a rolling pin and that, if I press too hard, it will either break or end up being too tough. In the case of this tart in particular, I at first tried to overcome this fear, but, considering I was a bit pressed for time and hadn’t let the dough chill for the required 2 hours, I rolled it out very roughly and unevenly and then proceeded to press the dough into the pan. I would, in fact, recommend this method to everybody making this because it not only struck me as infinitely more simple, but it also led to some of the best tart dough I’ve ever made: very firm and thick. The other thing I would add to these recipe notes is the fact that, when I finally cut into this beauty of a tart, some filling that had failed to set oozed out (perhaps 1-2 tablespoons worth). I’m not sure if this was the intended result (I assume not) or if the tart had perhaps needed to bake for a few minutes more (doubtful, considering the texture of the crust), but next time I may add either an additional egg, a half-teaspoon of corn starch mixed with a little water, or a tablespoon of flour to the filling. Then again, on the one hand, I’m reluctant to do this because the taste of the tart was just right–really rich and appropriately gooey–but, on the other hand, I hate to lose some of the filling. 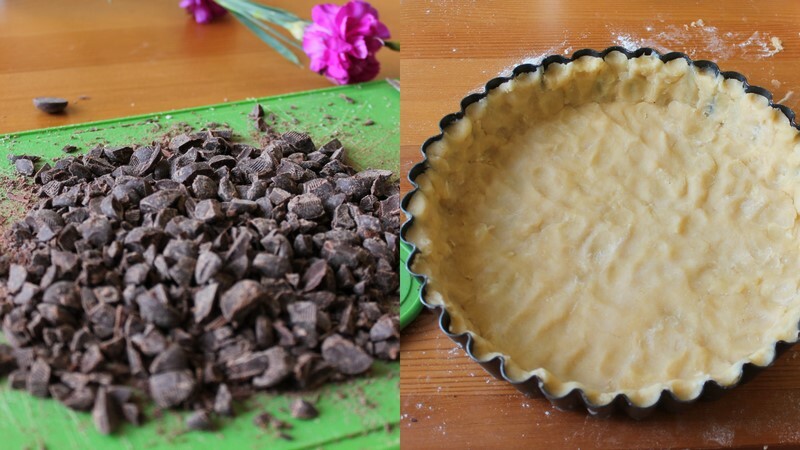 If you try the tart and any of the suggested methods, I’d love to hear how the final product turned out. -Whisk egg yolks and cream in a small bowl, then set aside. -In another bowl, whisk the flour, sugar and salt together. -Add the cubes of butter and cut them in with a pastry cutter until a coarse meal forms. -Slowly pour in the cream mixture and mix with a wooden spoon until just combined. -Transfer dough to a lightly floured work surface and gently knead (4-5 turns) so that the dough forms a ball (N.B. At this point, because a small portion of the dough seemed too dry, I added about a teaspoon more of heavy cream to incorporate the last bits of stray flour). -Divide dough in half and shape each half into a 1-inch disc. Then, wrap in plastic and refrigerate (I put one disc into the refrigerator for immediate use and the other in the freezer for Thanksgiving). -Chill until firm (the recipe suggests two hours, but I let mine sit for only about 45 minutes) and then remove from the fridge. -Let sit for 10-15 minutes and then gently roll out the disc on a lightly floured surface before pressing the dough into the tart pan with your fingers. -Once the dough is pressed into the tart pan, place the pan in the freezer for 30 minutes (N.B. The original recipe suggests that you chill the dough for 1 hour in the fridge, but, again due to time constraints, I opted for the freezer). -Spread chopped pecans on a cookie sheet lined with parchment paper. Toast, stirring once or twice, for 8-10 minutes and then remove from oven and set aside. -Whisk sugar, both corn syrups and salt in a large bowl. -Then, place butter in a small skillet over medium heat. Scrape in the seeds from the vanilla bean and add the bean as well. -Cook, stirring occasionally, until the butter has visibly browned and smells nutty (about 5 minutes). -Whisk warm browned butter into the sugar mixture and then add the eggs. Whisk to blend well. 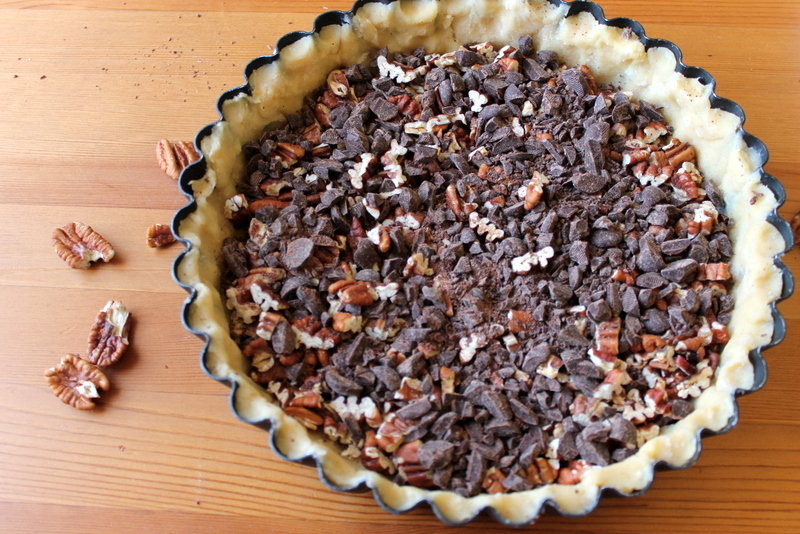 -Set this mixture aside while you assemble the tart. 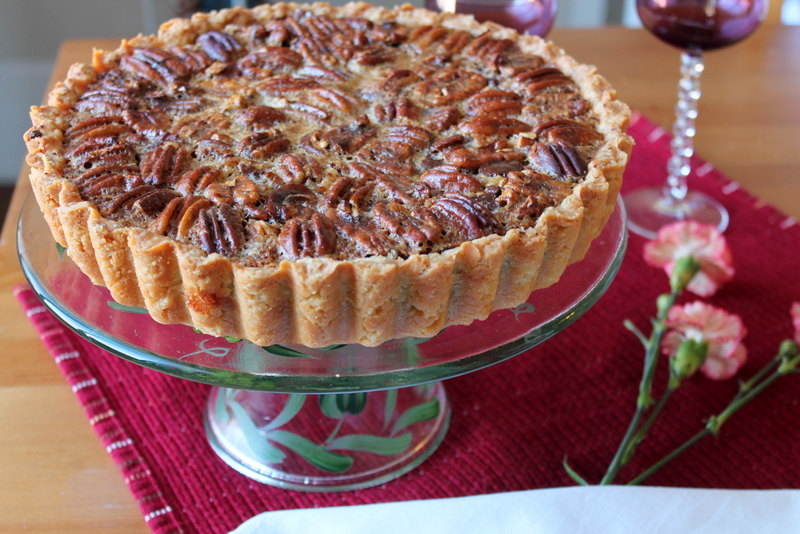 -Spread the chopped, toasted pecans on the chilled tart dough evenly. -Scatter chocolate evenly over the nuts. 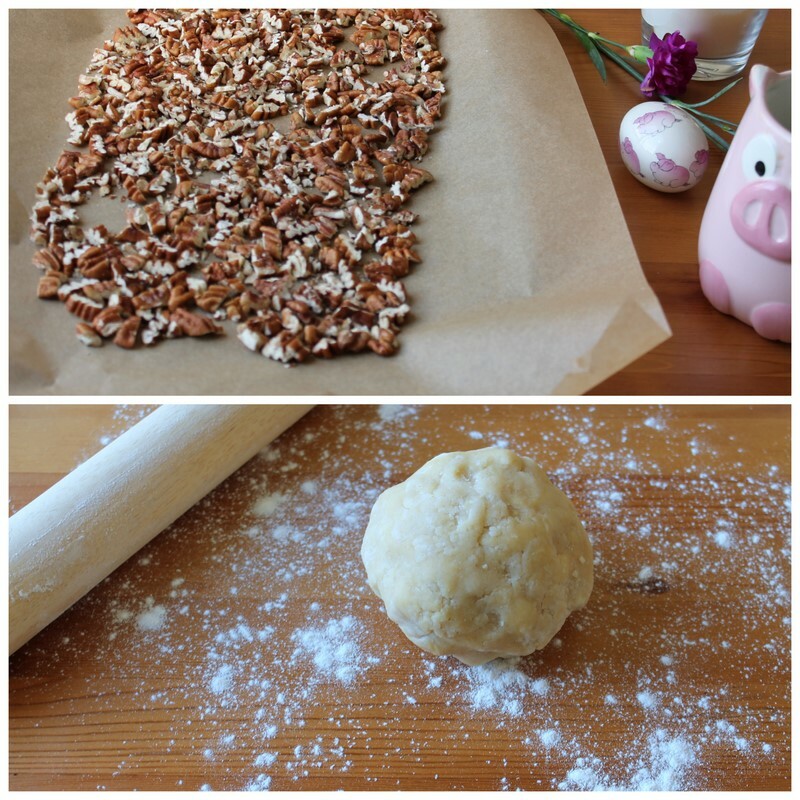 -Then, arrange the pecan halves in concentric circles over the chopped pecans and chocolate. -Pour the filling over the nuts carefully, making sure to distribute it evenly. -Bake tart (at 350 F) for 45-50 minutes or until the filling is just set in the center (N.B. Be sure to place an old cookie sheet or a sheet of aluminum foil beneath the tart as it bakes. Things got a little messy in my oven and this should help to spare you the unfortunate sound of the fire alarm and the unpleasant stench of burnt butter). -Remove tart from oven and let cool on a wire rack for at least 30 minutes. -Remove tart from tart shell and then let stand at room temperature until serving. -May serve with whipped cream laced with bourbon, or with vanilla ice cream. The tart on its own is also more than enough of a treat. This is so gorgeous, and it sounds divine! I was never a big fan of pecan pie growing up because there was too much of the gooey layer for me (not enough crunch, of course! ), but I think the addition of chocolate is inspired! I hope you have a great time in New Orleans, and a fabulous Thanksgiving! Your photos are so beautiful, and the tart crust looks particularly perfect! Congrats on hosting your own Thanksgiving — I am excited for you, and quite impressed. I can't wait to hear about it afterward! Thank you! Can you really go wrong with pecans and chocolate? I think the answer to the sticky, gooey quality of the tart is maybe more chocolate (never a bad thing) and more nuts (a positive on the texture side, right?). I don't know, but I'll have to figure it out in the next few days. I may go the cornstarch route, but it's hard to say. For now, I'm still sitting in my pjs, waiting for the rain to stop and simply thinking about everything that needs to be done. Small steps, small steps. Thank you, Moriah! The Greek's mother, who is quite artistic, helped me with the food styling (by the time I'm done cooking/baking, I rarely have it in me to do anything too creative). And I'm excited about Thanksgiving, too; I'm sitting here, mentally menu planning and wondering how eclectic my table can really be. I'm going to say very and just go with what feels right. 🙂 And a Happy Thanksgiving to you, too, especially if I don't see you tomorrow!